One of my favourite desserts to make whenever I need to whip something up last minute is Eton Mess. I can dash to the store, buy some berries, cream and meringues and have dessert on the table within 10 minutes. 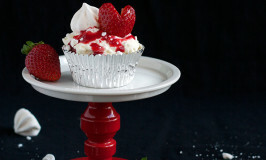 I decided I wanted to transform this classic English dessert into a cupcake for Valentine’s Day. 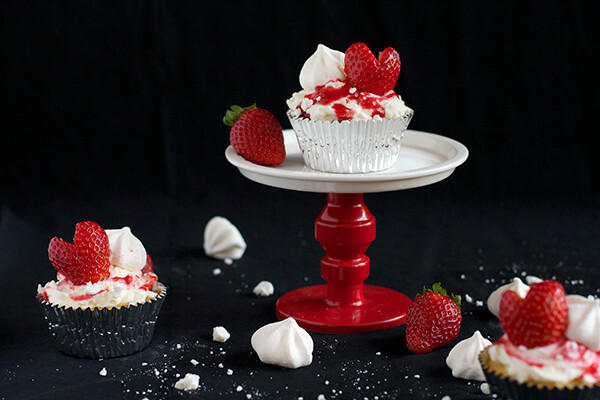 Not only is it the perfect colour scheme, you can easily transform fresh strawberries into heart-shaped cupcake toppers. I took my basic vanilla cupcake recipe and filled each cupcake with homemade strawberry filling. 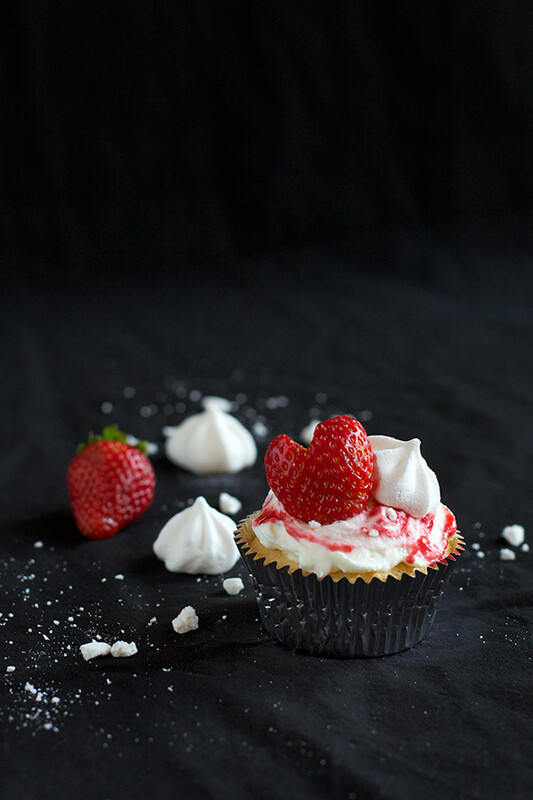 Once baked, the cupcakes are adorned with freshly whipped cream, crumbled meringues and more of the strawberry sauce. 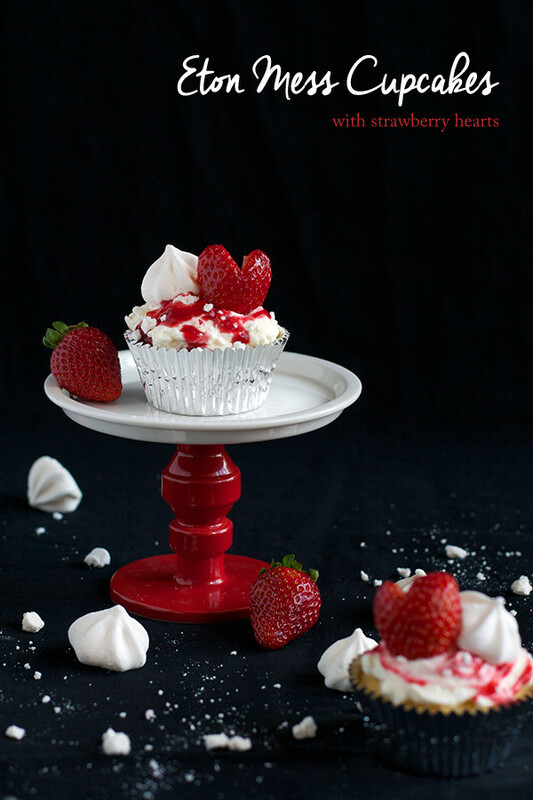 They are finished off with a little meringue and heart-shaped strawberry. Delicious and romantic. This recipe can be as simple or as complex as you wish. 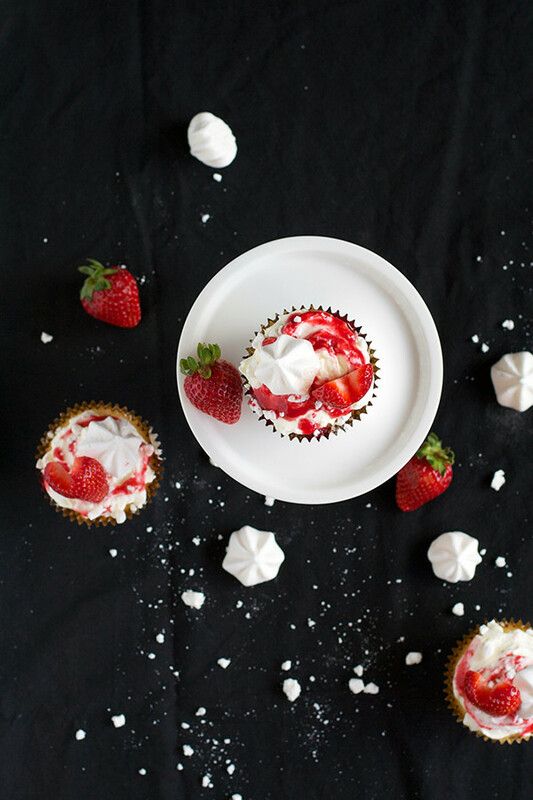 If you’re short on time, by all means swap the homemade strawberry filling and mini meringues for store-bought. Push mixture through a fine sieve to discard the pulp and seeds. 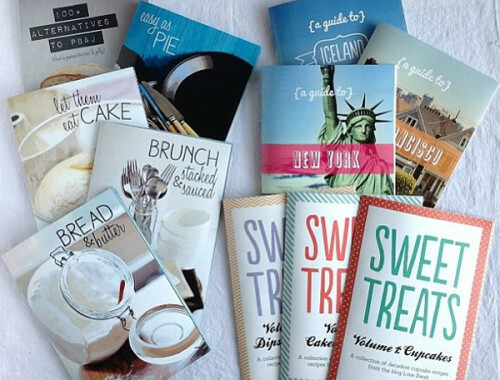 Set aside while you start the cupcakes. Fill cupcake liners about ¾ full with mixture and add a teaspoon of the cooled strawberry sauce to the centre of each cupcake (it will sink as the cupcakes bake). For best results chill the mixing bowl and whisk attachment in the refrigerator for 20 minutes. Pour the (chilled) heavy cream into the bowl and whisk on medium-high speed until it starts to thicken. Slow the speed down to medium and gradually pour in the sugar. Continue to whisk until stiff peaks form. Dollop a generous tablespoon or 2 of whipped cream on the top of each cupcake and smooth with a palette knife. Drizzle a little of the leftover strawberry sauce over the top and swirl gently with the back of a teaspoon. 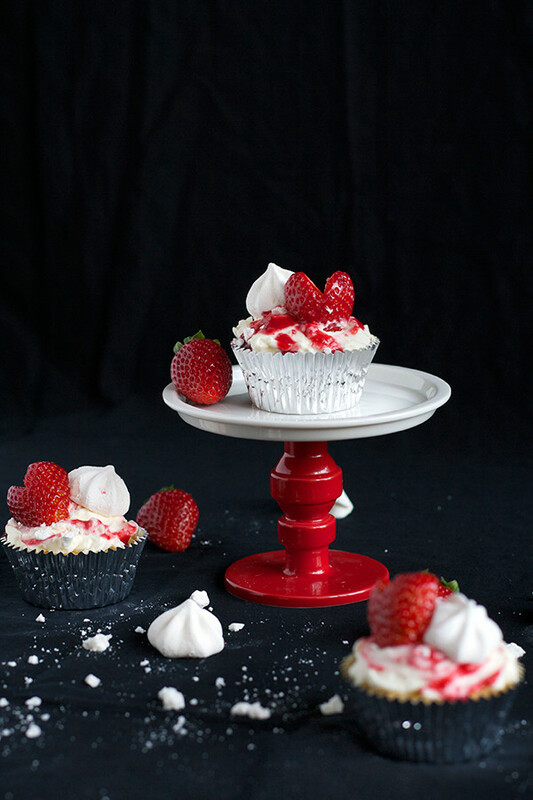 Crumble over a mini meringue and then top the cupcake with a whole meringue. Halve the strawberries length-wise and cut a little notch out of the top so it resembles a heart. Arrange each heart strawberry on the top of each cupcakes. To create the strawberry hearts, hull your strawberries and then slice each one length ways. Cut out a little triangle at the top of each strawberry and voila! A heart! Strawberries and cream is one of my favourite flavour combos, and I’m not going to lie, I ate 3 of these babies in one sitting. Oops. Your strawberry hearts are gorgeous! 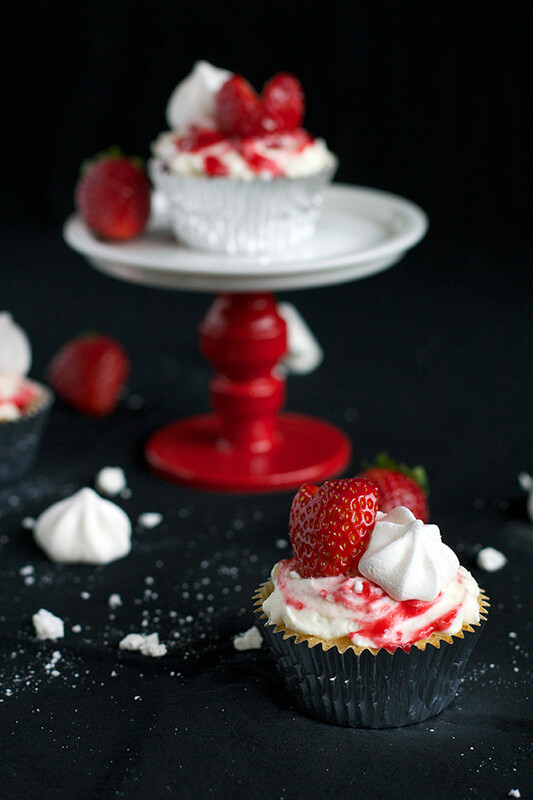 Strawberries and cream is one of my favourites too and these look just perfect. 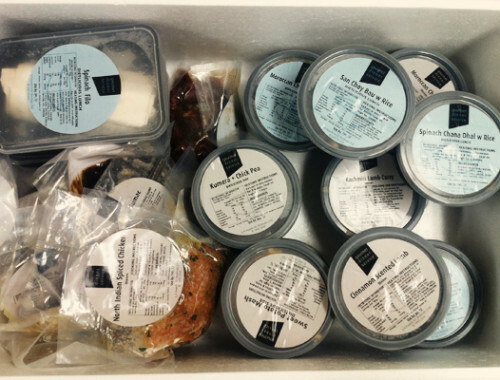 Thank you for linking up with us for Fabulous Foodie Fridays this week, have a great weekend. 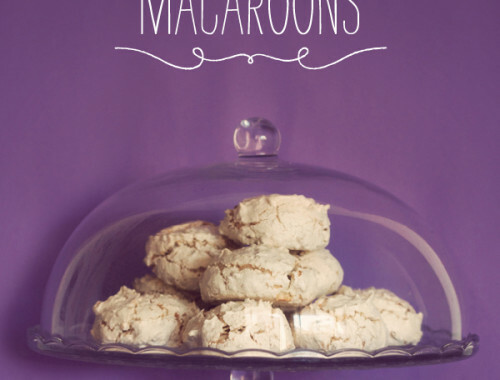 These look absolutely delightful! Well worth the mess.